An exercise in heavenly multitasking thats exhilarating alone but better with a friend. Lovers succeeds by asking you to do too much with too little. Your spacecraft is sliced in half like a peach, revealing eight rooms which serve different functions. One station controls the engines, for example, another the shields. The four gun turrets only cover limited areas. Crucially, you only have two crew members, so much of your time is spent dashing up and down between locations, dealing with enemies that appear on every side. In this jittery alternate future of love, lasers and intergalactic travel, the ladder is king. It sounds horribly stressful, but moving around quickly becomes a celebration of muscle memory, like deftly navigating the pause menu in a game you’ve played for years. If you’re alone, an AI pet helps out—Doppler the dog or Kepler the cat—but they can’t handle the complicated business of piloting. I found it easiest to leave them in charge of shields by default, send them to the guns when required. However you manage it, you can rarely relax. Although it’s easy enough to order your companion about in single player, Lovers comes alive when played with a human partner. Here you can instruct, argue, blame and forgive: all elements which make two-player games amazing. Unfortunately it’s local co-op only, but this feels like the way it was intended to be played. When you play alone, an already exacting challenge can sometimes become disheartening. Although I generally found my AI companion reliable, floating down the wrong path can lead to a swift death and the loss of 10 minutes’ progress. Failure is frustrating—especially when there’s no option to quickly restart—but I never felt stuck, only temporarily delayed. Generally, Lovers feels great. Your ship slides about reluctantly like a puppy on a polished floor. Gentle thrusts push you in one direction, and you can spin the engines round to nudge yourself through tight honeycomb tunnels. Lasers fizz, projectiles boing off trampoline shields. Your organisational skills are tested further by the Yamota super-weapon, which rotates around the circumference of your ship like the second hand on the Doomsday Clock. It’s thunderously effective when timed correctly, but risky. Simply waiting for it to tick into position will leave you exposed for desperate seconds—enough to fatally scupper your ship. Your shields, engine and weapons can be upgraded by adding gems. You start out naked, but by the end of each section you resemble a booby-trapped meatball, spewing out twinkling caltrops and smashing enemy craft with your cosmic bommy-knocker. Eventually, you can add multiple gems to each station, allowing for pleasingly varied combinations. Much like raiding your parents’ booze cabinet as a teenager, it’s a mix of randomly selected components with volatile consequences. Mixing metal and beam gems on a turret creates a wrecking ball that shoots lasers in three directions; the same combination on your engine sends you lurching forward on jets of light, leaving crisp lines of fiery metal in your wake. You can also unlock new ships, designed to stretch already taut relationships. For example, the Banana Split limits crewmembers to certain rooms, like bickering lovers in a divided flat. (“You can take the kids; I’m having the shield generator.”) It’s a smart way of suddenly making the game wonderfully unfamiliar, just as you’re beginning to master it. Mixing metal and beam gems on a turret creates a wrecking ball that shoots lasers in three directions. It constantly tries to present new challenges. Generally, your goal is to pootle through each randomly generated level rescuing imprisoned animals—think Sonic the Hedgehog, except you’re flying around inside a reformed Dr Eggman. 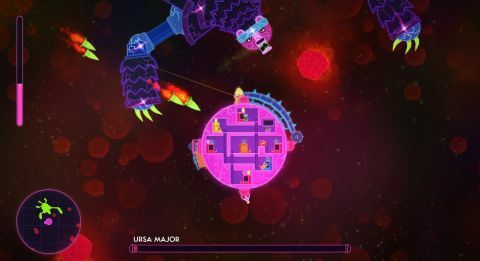 However, some levels force you to survive waves of increasingly dangerous enemies with a delicate hyper-drive that can’t be repaired once damaged. In another particularly tricky stage, unruly gunfire would break open eggs full of snapping aliens, so I had to change tactics completely, creeping through and carefully picking my shots. There’s variation everywhere. Some enemies are coated in icy armour, which has to be shot off with gouts of fire from nearby stars; elsewhere, physics-ignoring watery undercurrents drag you in circles. Each section also ends with a boss battle. These don’t offer the same reactive challenge as the normal stages, but they’re a fun way of celebrating big guns and orderly cooperation. Lovers isn’t particularly long—you could easily get through the campaign in around six hours—but diversity and some sticky difficulty spikes make it feel like a neatly plotted, distinguished adventure. Whether you’re exploring space with a capable friend or loyal pet, this is a stellar idea, romantically executed.